Do you really know the answer to that question? How well do you know yourself? As you go along lifes journey you are faced with many questions about yourself. What do you want from life? What makes you happy? What makes you, you. It’s ok not to have all the answers right now. This is where I come in. It takes time to get to know ourselves really well. A journey of self discovery is a very difficult one. Undertaking it may be very surprising, emotional and exhausting but you will arrive at a better understanding of yourself and what you want from life. A journey of self discovery is a daunting prospect. You need to be prepared for what you will find when you examine your life that closely. It takes time and you need to give yourself the space to focus on you. Busy lives often get in the way of this but if you give yourself a little time each day your path in life will become much clearer. 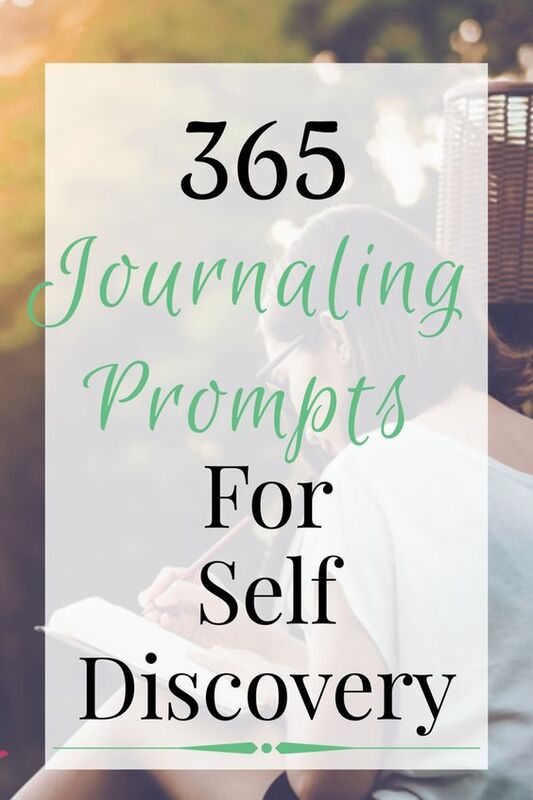 A journal is the perfect way to record your journey of self discovery. Writing down your thoughts helps them to become much clearer. Journaling prompts are a great way to get to know yourself, as you answer each question another part of the puzzle that is you emerges. As you go along your journey you will be able to look back and reflect on what you have written. 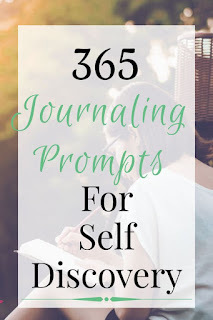 Below, I have given you a whole years worth of journaling prompts that you can use to discover yourself. I have compiled these prompts into a handy download which you can get below. Take your time and answer one question each day. Happy journaling! What are the 3 things you like most about yourself? What is the biggest compliment you have ever received? What do you need to make you feel safe? Do you worry too much? How can you deal with this? What is your favourite song? What does it mean to you? How would you want other people to describe you? What life lessons have books taught you? Is there anything that has changed your outlook on life? Who would you most love to meet? Are you good at decision making? How could you improve? Is there a part of your life that you wish was more organised? What is most important thing to enable you to live an authentic life? What are 3 facts about you that not many people know? Could you be more focused? How will you achieve this? What have you recently learned about yourself? What one thing can you not give up? What is the best gift somebody could give you? What rules or standards do you live by? Do you have self control or is it something you need to work on? How do you deal with obstacles that get in your way? Are you able to forgive others? Have you managed to overcome a fear? Do have problems releasing your creative side? Why do you think this is? Do you cope well when faced with a challenge? Are you a confident person or do you find yourself doubting your abilities? When was the last time you did something spontaneous? How did it make you feel? How much do you love yourself right now? Do you have any small rituals that give you comfort? What are they? Do you find yourself apologising a lot? Why do you think you do this? Do you have self discipline? If this is a problem for you, what can you do to improve? What is the biggest decision you’ve ever had to make? What are your beliefs, do you always stay true to them? What’s the most difficult choice you ever had to make? What would you like to do less of? How is the pace of your life? Is it too fast or too slow for you? Do you find it easy to feel empathy towards others? Do you feel that you are a good communicator? Do you have spiritual beliefs that help guide you? If you could sum your life up in one word what would it be? Are there parts of your life that you find distracting? Do you take the time to reflect on what is happening in your life? How do you feel outside of your comfort zone? Do you see this as a positive or a negative thing? Do you find your life fulfilling? Are you putting any parts of your life on hold? If so why? Can you admit when you are in the wrong? Are you good at organising your time? How could you improve? Do you display self destructive behaviour? What cause do you feel strongly about? How can you help? Do you react well in a crisis? How do you feel right at this moment? What makes you angry? How do you deal with the anger? What cheers you up when you are feeling down? Do you always need to be in control? How do you feel when you have no control over a situation? Do you deal well with change? If you ran away where would you go? Are you easily embarrassed? Why do you think this is? What was the last thing to surprise you? Do you hide your emotions? If so, why? Who or what keeps you calm? Do you carry emotional baggage? How can you deal with this? Are your emotions unbalanced? How can you address this? Are you easily frustrated? What is that frustrates you? Do you find yourself feeling guilt over things that are beyond your control? Do you ever feel envious? Do you feel that this healthy? Have you ever grieved for a loved one? How did you process this grief? What do you need the most in life? Do your emotions motivate you? Is this in a positive or negative way? Do you have mood swings? What do you think causes them? Do you find it easy to talk about your feelings, or do you bottle things up? Are you often disappointed with life? Do the changing seasons affect your emotions? Why do you think that is? Is there anything in your life that makes you ashamed? Are you a nervous person? Why do you think that is? Do you feel you lack courage? What do you wish you had the courage to do? What emotion do you wish you didn’t feel? Do you find it difficult to control your temper? If you could choose to have any emotion right now what would it be? What emotion do you feel most often? Do you ever feel inferior? Why is this? Do you let this fear rule your life or do you deal with it in a healthy way? If you could go back to when you were a child, what would you say to yourself? What has been the most difficult time in your life? If you could relive one day over again, what day would it be? What has been the best year in your life? Has your family life changed since you were a child? What was your favourite thing to do as a child? Have you said anything in the past that you wish you hadn’t? Did you enjoy school? What life lessons did you learn from your time there? Did you find it easy to get along with your peers when you were growing up? Did you ever experience bullying? How did you deal with this? What from your past do you wish you could do over? Have any past experiences shaped the fears and anxieties you have today? During your childhood did you ever feel let down by an adult? Did you ever witness anything in the past that you wish you hadn’t? What smell brings about good memories? What was your favourite family vacation? Were there secrets in your family? How did that affect you? Does the way you were brought up influence the way you (will) bring up your children? If you have siblings, how is your relationship with them? Has it change now that you are adults? What one thing have you always wished for? Is your life what you imagined it would be? What small change would you like to make to your life? What big change would you like to make to your life? What is your vision for the future? How will you get there? What do you fear most about the future? Does growing old scare you? You have decided to emigrate, where are you going to live? What one thing could you do today to help you achieve your goals? What could you do to improve your finances in the future? Is anything holding you back from achieving your goals? How can you deal with it? Do you embrace the “new”? Do you believe you deserve good things to happen to you? If not, why? What new thing do you want to try in the next year? What in your life are you still trying to figure out? What makes you happy about your life right now? What makes you sad about your life right now? What difference would you make to the world? What gifts to you want to share with the world? Do you have a dream life? What is it like? What do you think your mission is in life? Do you find it easy to commit to getting want you want in life? Do you find it easy to follow through on a plan you have made? What would give your life more meaning? Who would you like to reconnect with and why? Who makes your life better? How do you help your friends and loved ones? What time in your life did you need a friend most? How do you show people that you love them? Describe your best friend. What do you have in common? What makes the friendship work? What’s the best advice you could give to others? How do you deal with people who have different opinions and beliefs from you? Done you prefer a small or large group of friends? Are you ever misunderstood by people? You receive exciting news, who do you tell first? Think about your past romantic relationships. What lessons did you learn from them? What did each person bring to your life? What qualities do you like least in others? Do you feel that you have the support of friends and family? Do you feel that you are valued by others? What do you want other people to know about you? How comfortable are you meeting new people? What are the 3 most important things in a relationship? Can you accept people for who they are? Is there a relationship in your life you would like to change? How would you change it? How do you fit into your family? What is your role? Your family is always the people you are related to. Which non relatives do you consider family? Do you have any toxic friendships in your life? How can you deal with this? Do you find it easy to apologise to others? Have your views on love changed since you were a teenager? If so, why? Are you a secretive person? Do you find it easy to confide in other people? Do you share the same values as other members of your family? Is there a big difference between your values and those of the older members of your family? Are you attracted to the same personality type as yourself or the opposite? What one thing do you wish someone would say to you? Who did you last spend quality time with. Why do you think you connect well with that person? Do you think you are fairly judged by others? Is there someone in your life you should be spending more time with? Is there someone you should be spending less time with? Have you ever loved someone who didn’t love you back? How did that make you feel? Have you ever felt controlled by another person? Who, in your life makes you feel special? Who can you share comfortable silences with? Do you think people look up to you? Who can calm you down? Who are you not afraid to be yourself with? Do you think it is important to be honest with people even if that honesty causes pain? Do you have friends who have different backgrounds to you? Do you feel this is important? Who would you turn to in a crisis? Have you ever been afraid of another person? How did you deal with this? Do you ever feel sad about people you have lost touch with who were once important to you? How do you think your work colleagues feel about you? How do you feel about them? Do you have good working relationships? Do you feel that you need more encouragement from others? Can you communicate well in a relationship? Do you talk out your problems? Have you ever lied or cheated in a relationship? Did you come clean? Do you regret it now? How do you feel about your body? Would you change anything? How could you take better care of your mental health? What changes could you make to improve your physical health? Are you getting enough sleep? If not, why do you think that is? Do you lack energy? If so, what is causing this? Are you comfortable looking in a mirror? How do you feel about others seeing your body, for example at the beach? Do you worry about getting ill? How in tune out you with your body? Do you know when it’s time to rest? Does stress affect your body? How can you address this? Do you have a healthy diet? What changes could you make? Do you drink alcohol, if so are you drinking too much? Is there a way for you to cut down? How does alcohol change you as a person? Do you feel that your job is affecting your health? Do you overthink things? Does this cause stress and worry? What area of your self care do you need to work on more? Do you get time just for yourself? Is there something you need to give up or cut down on? Cigarettes/alcohol/caffeine? How can you take steps to do this? There you have it! A whole year of journaling prompts. Now I know there’s a lot to take in so just dip into it every day choosing one prompt. Happy journaling and good luck on your journey to self discovery. What Are The Benefits Of Journaling For Mental Health? This post may contain affiliate links. If you click a link and make a purchase I may receive a small commission at no extra cost to you. An amazing list that I and my daughter need to complete. I am sure it will be very enlightening. Many thanks for sharing.